This afternoon we had the best staff meeting that I have probably ever been to. Instead of dealing with issues, or 3 hours of PD after a long hard day, we just shared one aspect of our literacy practice with our colleagues. We are lucky at TPS in that we have a few teachers who are TESSOL trained, so we had the opportunity to learn a few insider tricks. We collated our resources on this doc (some links may not be publicly viewable). My colleague Ottilie took amazing notes about what/how each person presented which can be read here. At the end of the meeting I asked our SMT if we can do this again but for maths this time. 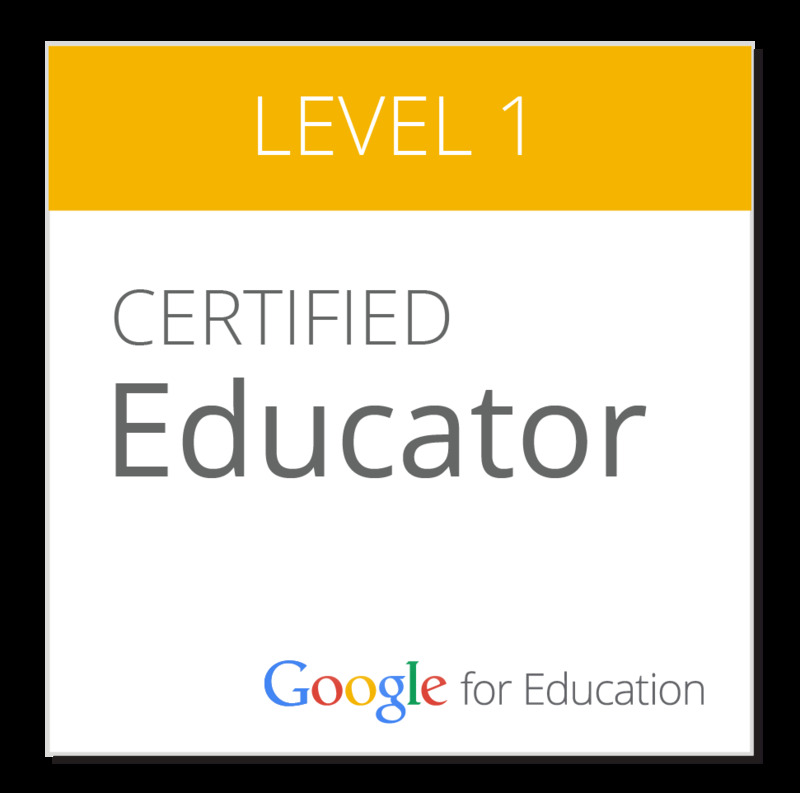 It is so powerful to be able to see what other staff members have tried and tested and found to be successful. I have finished my testing now, and so can analyse my students learning shifts to see how much they have learnt throughout the year. Of course, test scores do not always accurately depict a child's learning, nor does it define them. However, as a teacher, test scores are a reflection on my teaching ability (wether it is formally acknowledged or not) and hence teachers should look at them closely. At Manaiakalani schools, students start at 5 with the average abilities of a 3 year old.. and spend the rest of their lives trying to catch up. Because of this, our students cannot make 1 years progress in 1 year and be okay. In order to catch up, they must make more than 1 years progress in 1 year (accelerated shift). 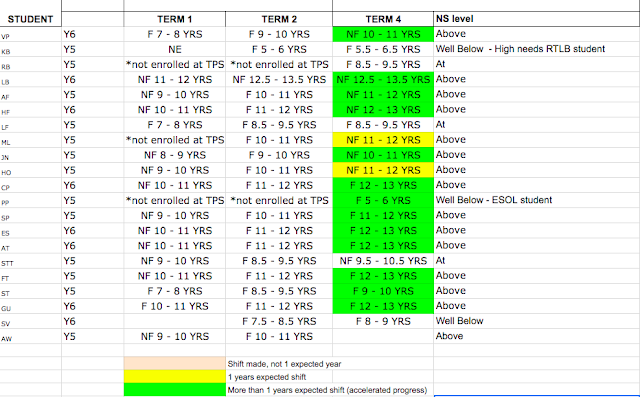 This is how I have analysed my data. Are my kids catching up? Or are they staying behind? I am incredibly proud of my maths shift data. 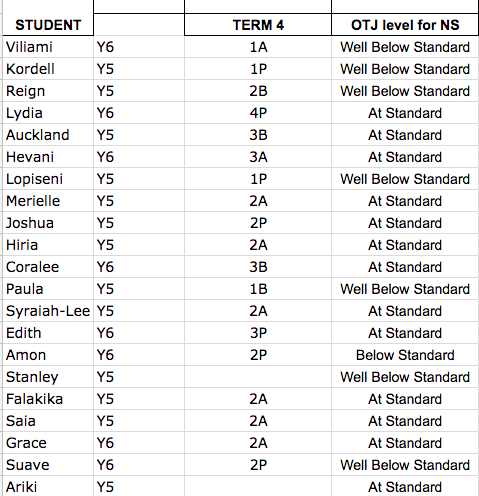 My kids were mostly at NS to begin with, but I am proud that I have kept them there or boosted them up to 2 years above where they should be. My class is interesting in that I have a group of very low students including ESOL students and students with high learning needs; sadly these students have made little progress. This made me really sad to see as they have been working so hard throughout the year to learn new skills and build knowledge, but some seem to have forgotten everything. Some, mainly student PP, is hindered by his lack of English, which results in him not understanding what to do. These students will continue to work hard and hopefully the new programme 'Spring into maths' that our teacher aides will introduce will help them as well. The rest of my class seem to have good accelerated progress. 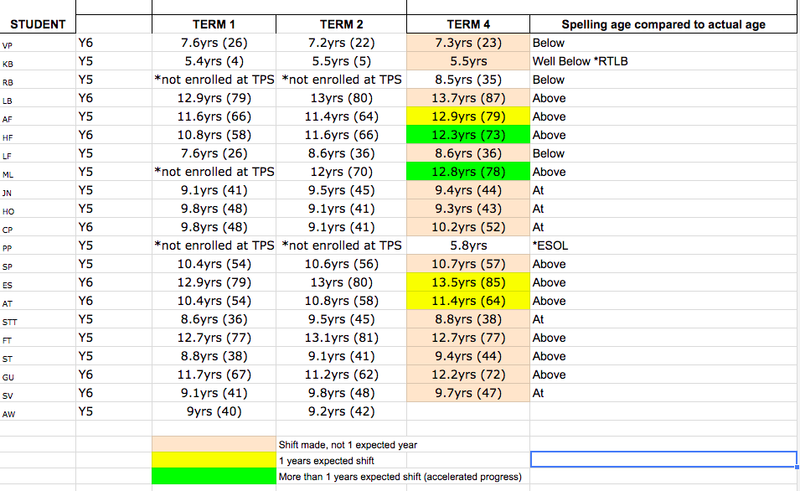 My target students, SP, ST and LF have made really good progress and are now 'at' or slightly 'below' NS for their age. The other target students, AW, VP and STT have not, as they all have missed A LOT of school. Again, this really saddens me because I know if they had been here, they would be learnt a heck of a lot more. Most students made huge progress in reading. I think this is because they have transitioned from 'learning to read' (mainly years 1-4) to 'reading to learn' (year 5 up). They have the skills required to read fleuntly, decode, understand diagrams, comprehend, ask and answer questions etc. I think it also made a difference testing them non-fiction at the beginning of the year, then fiction in term 2, then a mixture of both in term 4. Our school has no rule around which you should use, so I decided based on the content of the texts. Some probes require a lot of world and/or content knowledge to understand whereas others the information is purely inside the text. For the whole of term 3, the class read non-fiction texts (online, journals) as I felt they were stronger in fiction than non-fiction. I think it made a difference as they are more confident with wordy, diagram covered texts than they were in terms 1 and 2. Spelling is a weird area. Some teachers explicitly teach it, some don't. 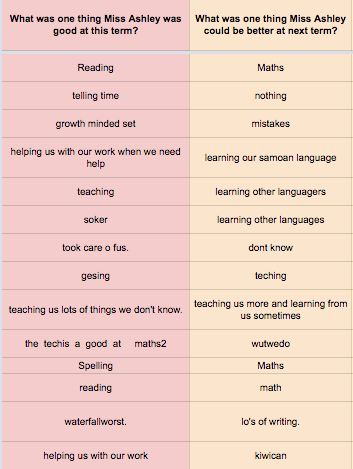 We did have spelling (with spelling lists the kids took home and learnt) during terms 1 and 2. We stopped as the kids seemed to loose interest in it. I think this is reflected in their scores. The jumps aren't as big as in other learning areas, however their term 1 scores are significantly higher than their chronological age to begin with. 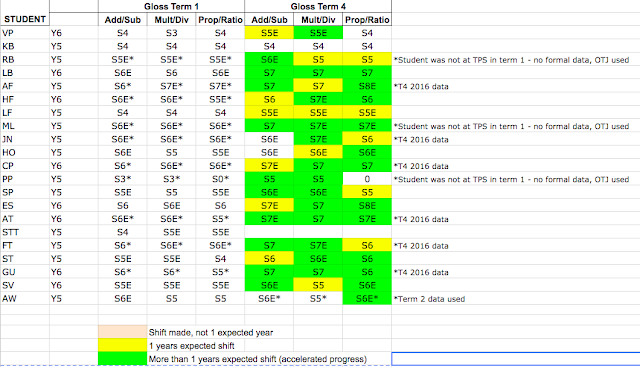 The shift was calculated based on term 1-term 4 scores, not their chronological age; if it had been all but 2 students would be above. This year my writing programme has been okay. I think writing is my weakest subject to teach out of reading, writing and maths. My marking of writing has been especially average. My kids jumped up heaps between terms 1 and 2, then went down in term 4 as my marking had to be stricter in term 4 (cluster moderation, syndicate moderation etc). This is something I need to work on moving forward. For their OTJ's, my class is very split. Heaps are 'at', and heaps are 'well below'. The well belows are made up of high needs students yes, but also some who just don't have the required skills. When I originally marked their term 4 writing samples, maybe 1/3 were above. After moderation, these got moved down to 'At's. Some belows got moved to well belows as well. Again, consistent marking of writing is something I need to work on. My class have made HUGE jumps this year. Yes, I did have really high kids to begin with. But I have kept them high and kept pushing them. I am proud of what they have achieved, and know what I need to work on next year. Note: these are raw test scores. 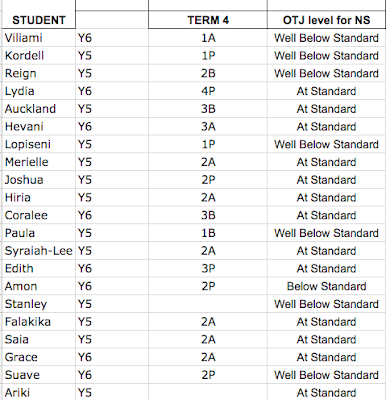 They do not necessarily reflect my OTJs of these students, which can be seen in the writing scores.